Several medivac helicopters flew to the island on Tuesday afternoon after a rubber raft capsized in the waters off the coast of Terschelling. Omrop Fryslân reports that there were six people on board the raft when it overturned in the water. Several people ingested some salt water and panicked when the raft capsized. The Coast Guard confirmed that they transported three people to hospital on the mainland to be treated for hypothermia. Four other people were also taken to hospital in connection to the incident. 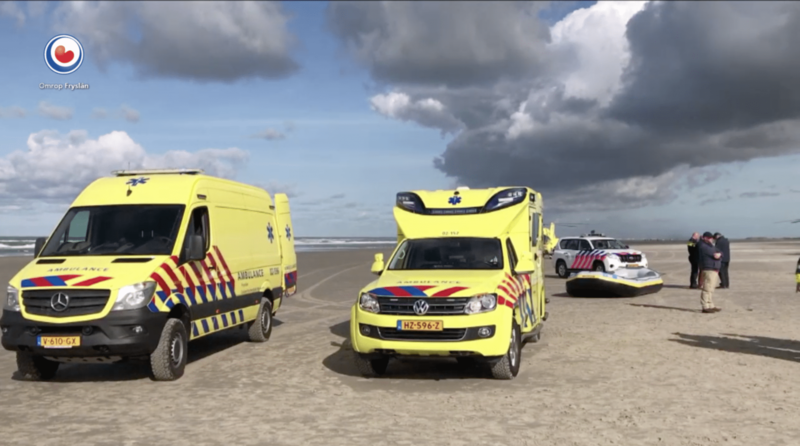 Medical helicopters from Groningen and Amsterdam landed on the beach and several ambulances were also on the scene to stabilise the victims. The raft passengers were rescued from the water by the branch of the Royal Netherlands Sea Rescue Institution on Terschelling. The Leeuwarder Courant writes that the boat was a rental from Terschelling-based excursion company MooiWeer. There were two rafts on the water paddling through the waves when one capsized and several people fell overboard on the other raft and were unable to get back into the boat. An instructor who was present on one of the rafts also helped bring the people in the water to shore. According to MooiWeer’s website, passengers on the raft excursions must be at least 15 years old and have a swimming certificate. The season for visitors to book a raft starts in May and ends in early October.